ST. GEORGE – The Dixie Rebels hosted the Utah Shock in a game that was critical for both teams to win. The Rebels took control of the game early leading 16-3 in the second quarter, but the Shock got right back into the game getting within three points at 16-13 in the third quarter. The Rebels were up 26-20 late in the game and kicked a deep field goal that would have sealed the deal, but having nailed a 49-yard field goal earlier, Steve Pulver didn’t quite get enough power behind it and the 55-yard field goal fell short. The Shock then got the ball back and turned on the high intensity passing attack that has them averaging almost 40 points per game. After the Shock completed a few passes, the Rebels put more pressure on Shock quarterback Jordan Kjar. On two different plays it looked like the Rebels were going to pick up a sack, but Kjar took off and picked up big chunks of yardage to keep the chains moving. The Shock were in field-goal territory and continuing to move the ball until, with less than a minute left, the Shock were facing third-and-2. The fans really started cheering, chanting, whooping and hollering. At which point, the Rebels’ defense stepped it up and stopped them on third-and-2 by getting enough pressure on Kjar to force an incomplete pass. The Shock, forced to go for it on fourth-and-2, faced even more intensity from the crowd as they started stomping on the bleachers in addition to all the yelling. Again the Rebels’ defense stepped it up to force a turnover on downs which allowed the Rebels to take a knee and end the game with a score of 26-20, to earn the No. 1 seed in the tournament with the advantage of playing all their playoff games here at Walt Brooks Stadium, Dixie High School. The Rebels certainly had the advantage on defense, shown by the fact that they held the Shock below their season low of 31 points. They were able to get enough pressure on Kjar to make crisp passes difficult. The Rebels’ defense also got a safety early in the game to put them up 2-0 and forced two turnovers; and both Pulver and Misi Tupe picked up an interception. The Rebels also had a few tricks up their sleeve, which helped them secure the victory. 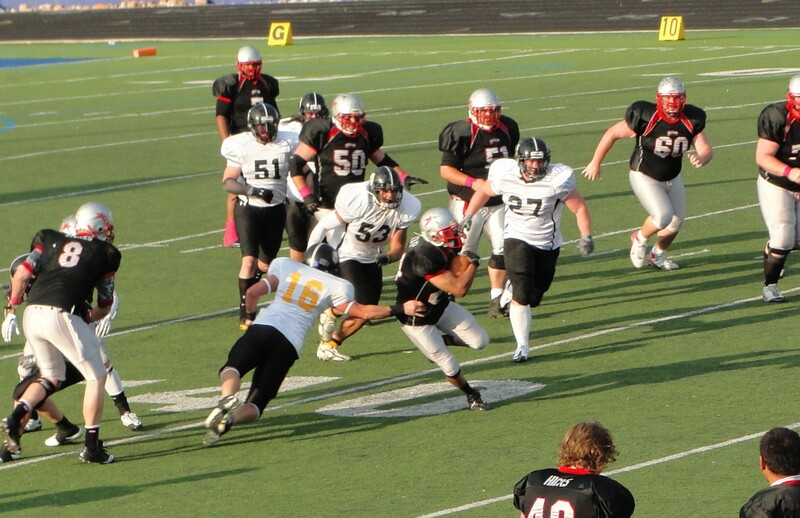 A month and a half ago, Andy Stokes hyper-extended his knee in the game against the Logan Stampede. It has gotten worse since then. He was only able to play in a few plays against the Stealth. It was widely known that he wouldn’t be near 100 percent, but everyone wondered if the bye last Saturday would be enough for him to get back on the field. Apparently it was, as Stokes played throughout the game. It was visible that he wasn’t running at full speed, but he was able to get open a few critical times – including a 14-yard catch and a 26-yard catch. The next surprise, which was more surprising than the first, was the return of Diarra Fields. In their last game, the Utah Valley Stealth were able to “cheat” on defense. In other words, they were able to put a huge defensive emphasis on stopping the Rebels’ running game and could almost ignore the Rebel receivers because they were throwing so few passes. Fields, who suffered a broken ankle and a severe strain back on May 5 in the first half of the game against the Rocky Mountain Mudd Ducks, was expected to be out until at least June 16, if he came back at all. He wasn’t even close to 100 percent. That much was obvious as he didn’t ever run the ball, something that he is known for doing very well, and didn’t throw it very many times. Even though Fields mostly just handed the ball off, it made a huge difference in the outcome of the game for two reasons. First, the handoffs to the running backs are more crisp as he’s worked with them a lot more than A.J. Martinez has. 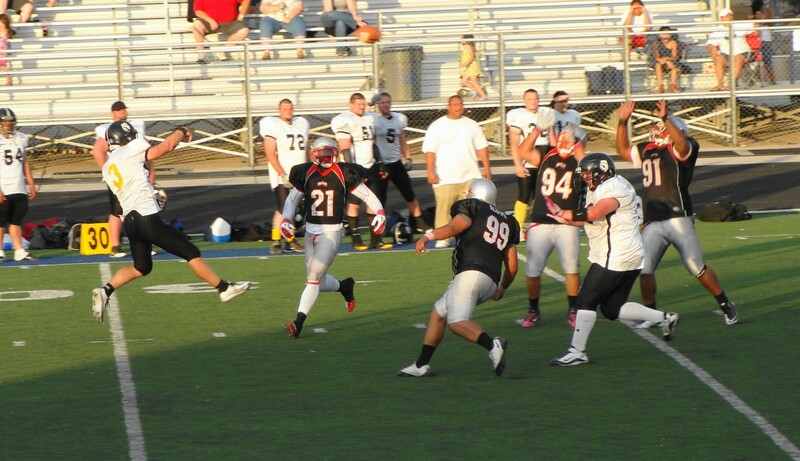 Second, he threw just enough passes to keep the Shock’s defense honest during the first three quarters. Not only did he complete a few big passes to Stokes, but he also threw a nice 39-yard pass to Kyle Coop early in the game, an 11-yard touchdown pass to Dallas Irvin, and a big first-down pass to Cameron Murdock which set up Field’s 8-yard touchdown pass to Irvin. After the game Coach Dan Odette said that in the fourth quarter Fields had to completely quit passing the ball because the Shock were putting a lot more pressure on him and kept hitting him. At that point they quit calling pass plays with him because they can’t afford to have him injured again. As Fields was getting hit more than was acceptable, the Rebels needed to pull one more unexpected trick out of their sleeve to get the win. They added a new wrinkle to their offense one that Odette said they just implemented and got reps in for it at practice this week. On strategic plays, Tupe would come in for Fields. Tupe was taking the snaps and running the option. At first it was a little clunky, but then it started to work and they were able to get a critical first down with it late in the game. With the surprises that they sprung on the Shock, they still just barely won. 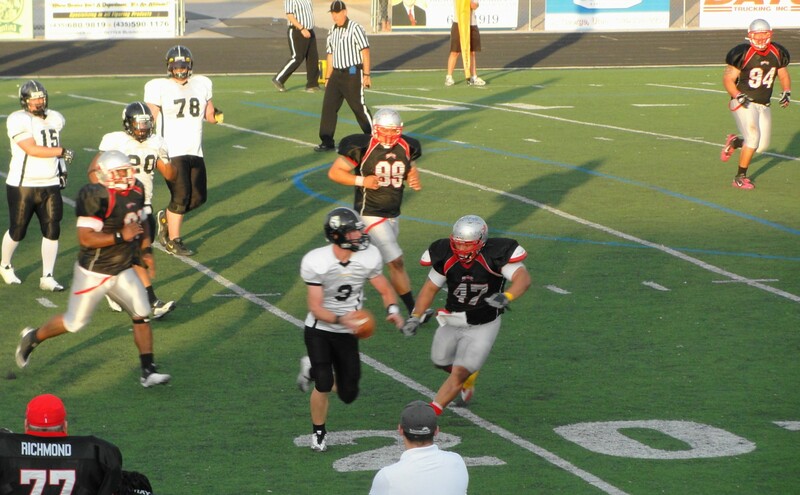 Many in the league are predicting a rematch on June 30 in the RMFL Championship game. If that is correct, we may just be privileged to see another close, exciting game here in St. George for the RMFL Championship game. Thanks for keeping us up to date Leo. I love reading your articles. I’ve been watching NBA for alot of years and i feel secure about the whole american football thing so i think ill start watching the leagues aswell thank you for making this article.